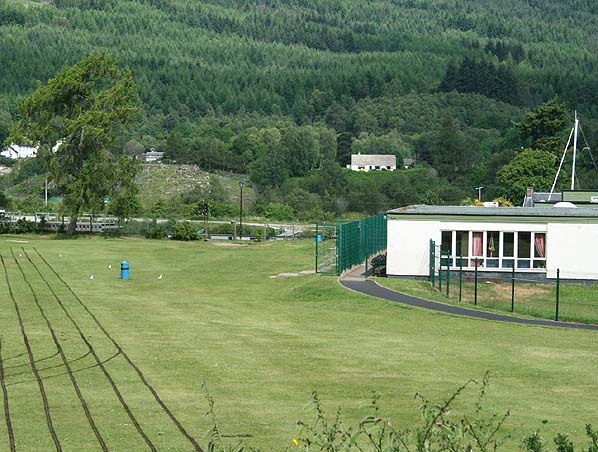 Present state: The station has been largely demolished and the site is now occupied by a school and playing field (Kilchuimen Academy). A short section of the through platform survives on the school premises with the end ramp protruding through the fence onto a public road. Notes: Fort Augustus Station had two platforms, one was an island so there were three platform faces. The two platform faces to the west were terminus platforms and were used by most trains serving the station. The west platform face (the west side of the island platform) was for through trans serving the short lived passenger station at Fort Augustus Pier. 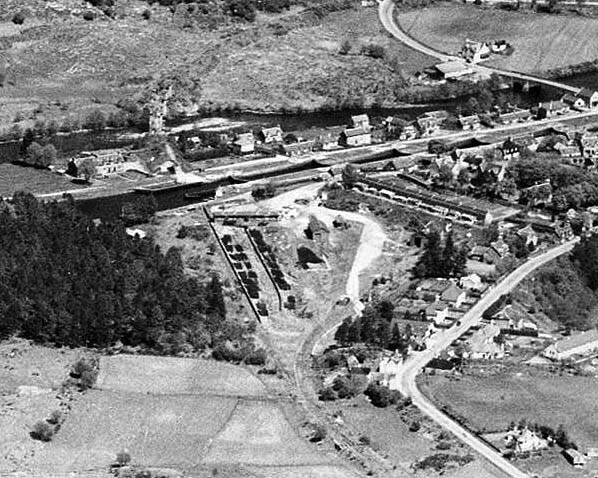 Beyond Fort August station the line immediately crossed the Caledonian Canal on a swing bridge and beyond the canal a viaduct carried the line over the River Oich. The station remained open for freight traffic until 1.1.1947 but clearly the passenger platforms were not used as the picture below shows the track had been lifted by 1938. A goods loading bank was sited 1/4 mile south of the station. so convinced were its promoters that it would ultimately become part of a ‘Great Glen’ trunk route. villages it served were sparsely inhabited and the only forms of revenue were on Market Day and the use of the line by monks attending a Seminary nearby. 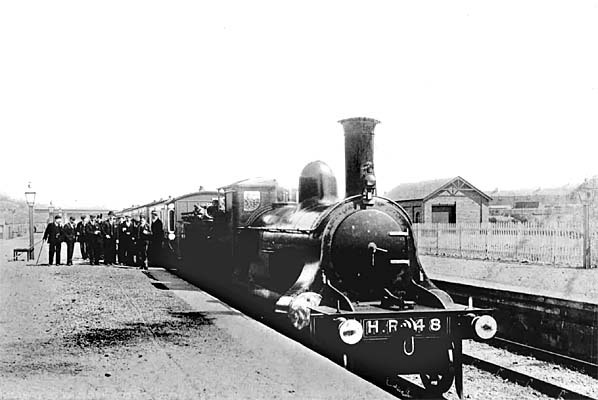 August 1913 there was no service at all, as the North British was not prepared to lose any more money and were only willing to restore a service when the line was sold outright to them. 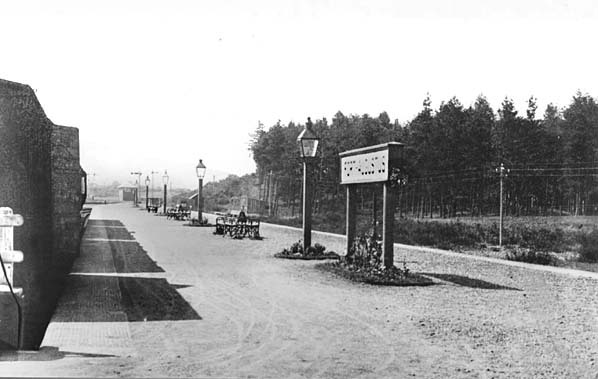 They paid £27,000 for the line and the Fort Augustus Hotel, a fraction of the £350,000 cost of building the branch. They were then able to operate the line under the North British Railway (Invergarry and Fort Augustus) Vesting and Confirmation Act of 28th August 1914.
connection with logging activities. The daily freight train was withdrawn in 1945 and the weekly coal train was withdrawn from 1st January 1947. There was a final special on 28th March 1947 for prospective hiring of the line by a timber merchant but this didn't happen and the track was lifted shortly afterwards. Today some sections of the trackbed are used as a logging road. 1900 1:2,500 OS map shows Fort Augustus station under construction. Fort Augustus Pier can be seen on the right. 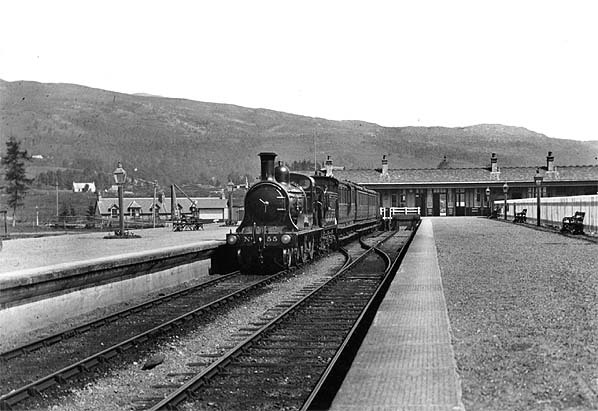 The terminus platforms at Fort Augustus Station in 1938. Through trains to Fort Augustus Pier used the a platform face on the left side of the island platform seen on the left. 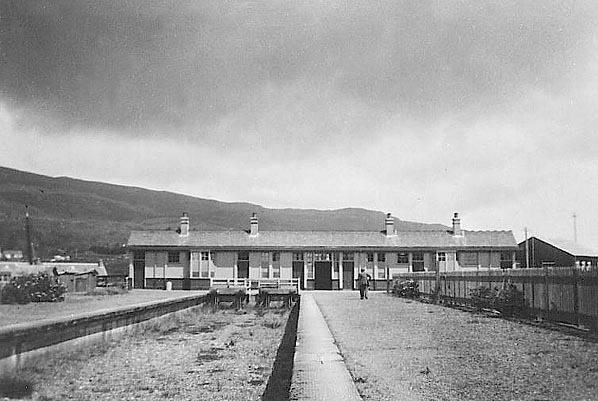 Fort Augustus Station in May 1950. The goods yard is seen to the east of the station. 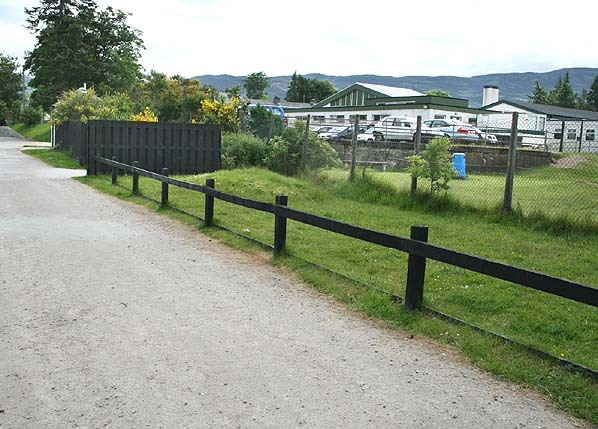 The course of the line to Fort Augustus pier is cear on the far side of the Caledonian Canal.